Beautiful..excellent use of the light. 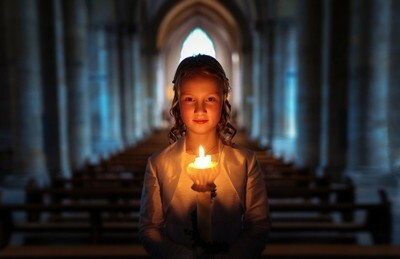 This was just natural light from the main part of the church and the candle was used the light of the face of the girl. I just saw the dark area in the back of the church and thought it would be a great idea to take a picture there, using the candle to light up the scenery. My normal workflow is to take the picture and make basic adjustemnts with the raw file. Than i go to photoshop and use some adjustement layers and make it more pop by using a vignette.